When Mich Kenney reached out to me over Christmas, I was excited and jumped at the chance to host a Q&A. I'm a very nosy person and love finding out how authors work, what inspires them, and challenging them to describe their own books. 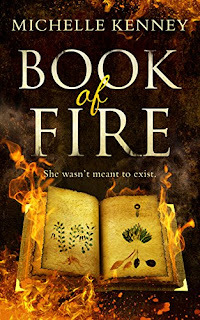 Book of Fire has been on my radar since it was released as an ebook back in 2017. 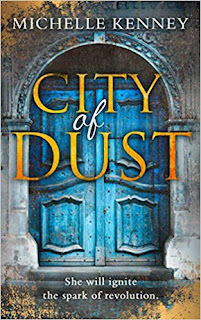 Now City of Dust has just released in ebook and paperback and I'm itching for Book of Fire to come available in print so I can read it. The amazing Charlotte Somewhere has already reviewed Book of Fire so I'll direct you there if you want to find out what she thought. Can you describe the Book of Fire trilogy in five words? What inspired you to write the world the way you did, with the mix of dystopian and historical? I’m fascinated with our perception of time, with the idea that we are always moving forward, when modern physics suggests time-space theory is less linear. In Book of Fire, Octavia (Isca Pantheon's dictator) looks back for a successful civilisation to emulate as part of her Biotechnical Program to establish a genetically modified (Roman-inspired) civilisation. I wanted to convey the idea that great success can often be a glossy veneer, and in this case, hide systematic brutality, slavery and corruption. It was also about acknowledging that while the future can offer up great opportunity, choices need to be made sensitively and intelligently, with reference to global responsibilities. Decisions made within a privileged micro-climate can have ramifications well beyond immediate walls - no matter how impenetrable! This is so hard...I love Aelia's feisty intelligence. She’s a Prolet-born Doctor, General of the Prolet Freedom Fighters and is full of secrets. She’s also mouthy, a natural feminist, and incredibly gutsy, noble and kind. It’s impossible not to have a soft spot for her. But I find Lake (City of Dust) really interesting too - no spoilers but I think her multi-genus heritage would make her a pretty fascinating coffee companion. Then again, there’s August, a modified Equite knight with real Roman DNA…arrgh... I’m rubbish at this! Do you think that you would be able to survive in the world of your book? I’m a plantser. I draw out 10,000 word ‘stages’ which establish my key plot points & character arcs (these have been especially important within the Book of Fire trilogy to ensure I don’t leave gaping plot holes or smaller characters out in the cold) and then allow loads of room within these individual stages for the story to grow naturally - a little seat of my pants style. The unpredictability. Every day is different and, as I try to count time rather than word count, my productivity varies too. Some days are clear idea and writing days, while others lend themselves to editing/more research-based tasks. I enjoy them all. Book of Fire Three - the final feral chapter in Talia's Book of Fire adventure which is due out late 2019! I tend to be an all-consuming writer so I put everything into my current project, but I have lots of ideas about what to write next. My writing heart is very happy in fantasy just now, it was my first love and I find its complete freedom addictive - but I love all types of books and I’m not ruling out contemporary or general fiction at some point in the future. I think you could safely say I’m hoping to stick around. Click on the covers below to add the books to Goodreads. This is a great Q and A! Thanks for the link to my review. lovely q+a, i hope BoF is in print soon for you! These are really good questions. This was such a good read. Wonderful Q&A! This has made me so interested in Book of Fire, it's going straight onto my TBR. Wonderful Q+A! Made me more interested with the books. Plus, the cover looks good! Great Q+A! Those covers are gorgeous! A really interesting interview! I have seen Book of Fire pop up on my feed for a while and must go check it out. Dystopia meets mythology sounds amazing. Whoah! 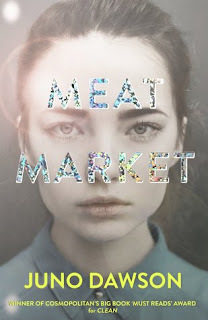 Historical fiction and dystopia? I am so down for this one!